Lots of birds around this year in northern Maine . I am jealous Gasblaster. 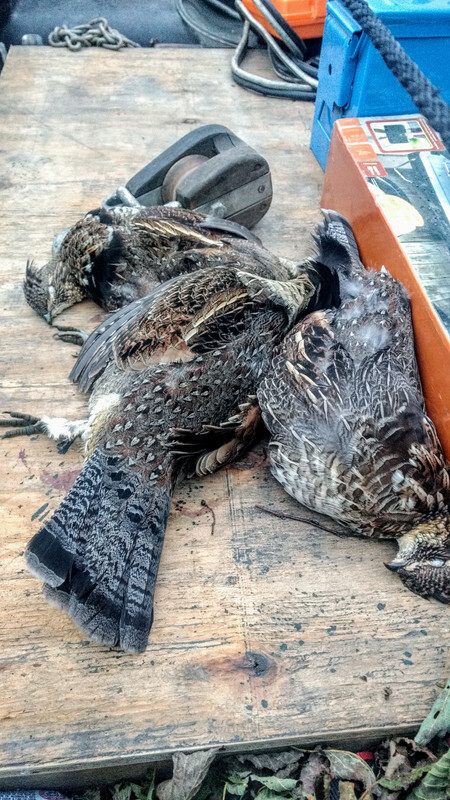 We no longer have any grouse here in RI and that species has actually been closed to hunting for a few years now. The only wild birds that we get are doves and woodcock. Speaking of woodcock, we have seen 6 in 2 trips which is more than we have seen in the last 10 years. Maybe just luck but I am thinking there is a huge movement of them right now and they are all here in RI. Got them at both ends of the state as well. Thanks Green Mountain. 1 cooler full of birds, 1 cooler full of beer, and hopefully 1 cooler full of venison after this weekend. Come on down. Good luck and have fun up there GMH. I was lucky enough to get a babysitter yesterday and was able to tag this 105 lb dressed doe. Clean shot with the .50 through both lungs. She was still able to go up a steep cliff about 50 yards before expiring. Now I need to fill my buck tag.